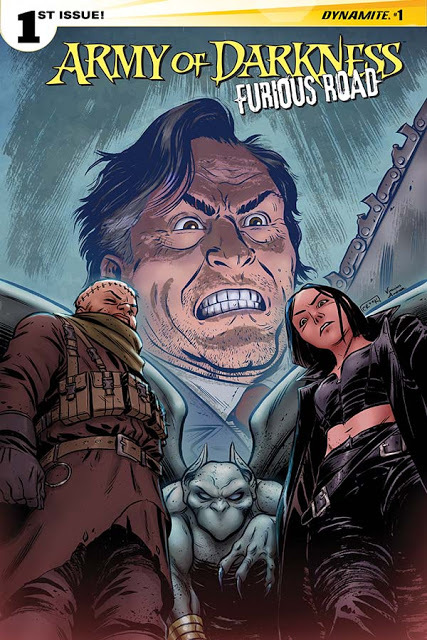 If there's one complaint about Dynamite's new Ash series, Army of Darkness: Furious Road, it's that it goes by so fast. Nancy A. Collins throws us straight into the action as an eclectic band of road warriors are rolling through future Detroit in a caravan to some unspecified location. They find what they were looking for and get more than they bargained for. Based on the Evil Dead movies starring Bruce Campbell, the latest comic book version finds Army of Darkness taking on a Mad Max-style approach with a tense crew of biblically code-named individuals driving fully armed armored vehicles while fighting off marauding cackling deadites. There's even a machine gun wielding nun for some reason. They eventually reach their destination, a convenience store in ruins. And they come across the man himself, Ash. This is all table-setting but it's a fast-paced thrill to see Ash and the group fighting together but there's not much else explained. Consider this first issue more of an appetizer than a meal. Collins does a great job pacing the issue, it's a slightly visceral experience but I just want more of it. The art is terrific though. Kewber Baal has the skill of a cinematic director. His "camera work" contributes to the kinetic look and feel as the perspectives change from one panel to the next. The layouts themselves are creatively varied adding a punch to certain events. Schimerys Baal's colors give it the proper gritty look of this dystopian landscape, capturing a world at dusk littered with trash and deadites. There's plenty of depth amid the shadows. Army of Darkness: Furious Road #1 is a fun, gory, thrill ride that ends too soon. It's a nice addition to the Evil Dead mythos and it certainly whets the appetite for more. Despite the briefness of this introductory issue, Collins and the Baals instill enough confidence that this title is good enough to add to your pull list.